… join our birthday party and/or Personal Branding Workshop this October 29! Last year I decided to create my second company www.YouBrandBuilder.be with the ambition and mission to help entrepreneurs and intrapreneurs, get noticed, stand out from the crowd via Personal Branding, in order to achieve business & career success and enjoy (financial) freedom. I want to help people grow, so they will never be small again. I believe everybody has the right to shine and to be proud of it! You too! Enjoy the climb up the mountain. But never take your eye off the summit. Will it be easy? Nope! Worth it? Absolutely! This brings me to celebration. 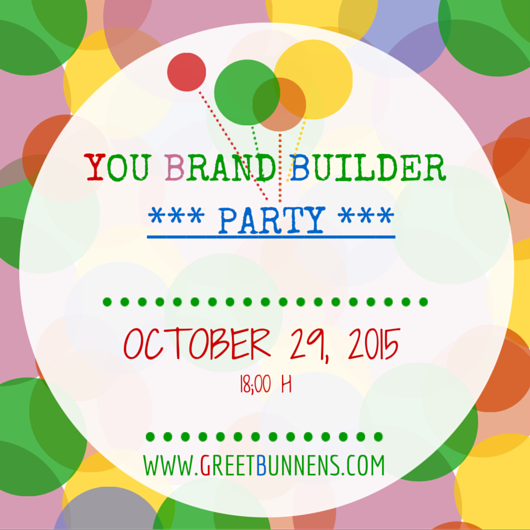 I would like to celebrate the first birthday of YouBrandBuilder with you and you are invited to a little party and a workshop. What? You’ll disover the 5 steps to build your Personal Brand immediately. Why? Because if you want to become a leader in your field, you have to stand out, be visible and show what you are worth! Don’t worry! It’s not about bragging, it’s not about becoming somebody else, You’ll learn how to build your Personal Brand in an authentic way – while staying true to yourself. When? Thursday, October 29 at 2 PM. Subscribe before October 25 if you want to attend the workshop via this link. When? Thursday, October 29 at 6 PM. Subscribe before October 25 if you want to attend the party via this link. BEWARE: if you want to attend the workshop AND the party, you have to subscribe to both. I’d love to see you at both events!!! Thanks! See you on Ocotber 29!Big hug! Greetjeshare if you like !